The DIR-636 RangeBooster from D-Link is a draft 802.11n compliant device. 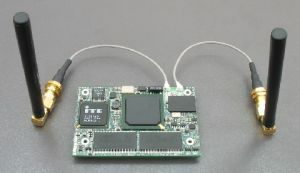 It supposidly runs 5x faster then the 802.11g wireless connections but yet is still compatible backwards. 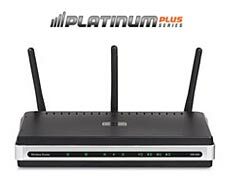 It can in some cases provide a faster then 100Mbps signal. With the device you can create a secure wireless network in your home which makes file sharing across your computers a lot safer. It is also compatible with VOIP protocols so that calls can run smoothly. This is great news… and incredible that so much can be put in one small credit card sized device… ok I am sure it’s the usual “credit card sized… but about 10 credit cards thick” but either way… it’s cool. The Zypad WL 1000 is a wireless computer watch. The thing is rather huge but may have uses somewhere such as while climbing or caving where an accessible computer is needed from time to time. More seriously, this might become a good tool for emergency situations where because of it's hands free functions which are available right away. The Jump drive is a USB memory drive with a twist. It features an LCD b/w display showing the current memory usage on the stick. The display uses e ink to keep it active while the drive is not plugged in to the machine and also updated indipendantly from the system it is plugged in to. This means that no software is required on the computer to update the meter. It’s a very handy little extra to be added on. 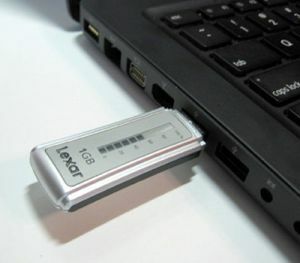 The Lexar Jump Drive also includes Jump Drive Secure II which is their software used to create a secure encrypted area on the drive just incase the thing gets lost. Toshiba are launching the new Tecra M7-117 model which sports a dual core processor running at 1.83Ghz. The M7-117 is a tablet PC running Windows XP Tablet Edition 2005. The standard RAM is 512Mb which is upgradable to 4Gb (DDR2 533Mhz) and has an 80Gb drive. The tablet comes with all the standard features such as Wifi, bluetooth and a lot more. Other new Tecra M7 products can be pre ordered through the link below. Using 2 or more monitors on your PC can increase productivity. Have you ever wanted to copy data from a spreadsheet in to a word document and you get fed up of minimizing one window to see the other. Having 2+ screens can help. I use 2 screens at home and run email on 1 screen and terminal services etc… and browse the internet on the other screen. This offers a great improvement to my productivity allowing me to work on a system while following notes on another screen. 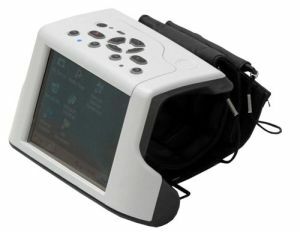 Matrox have introduced a $300 TripleHead2Go device which increases the “real estate” in front of you. You set the resolution on your laptop or PC to higher and then plug your output in to the box and the box in to 3 19″ Flat Panel Displays (no doubt for $300 you only get the TripleHead2Go box). This gives you a combined resolution of 3840×768 which is far better for spreading your windows about on your computer. Also note that it all acts just like one big desktop and if you want a window over on the right you just drag it to the right like you would on a single screen setup. What I like about FuelCell technology is that you can replace the cartridges quickly for cheap and have instant power again. FuelCells are going to be a great way forwards. 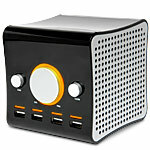 This handy little speaker that doubles up as a 4 port USB Hub is now for sale at iwoot.com. 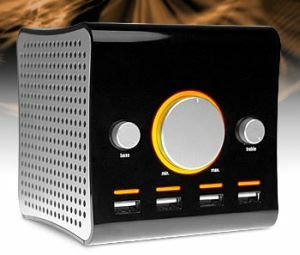 * A stylish cube shaped computer stereo speaker with integrated USB hub. * The Cubite has an easily rechargeable 4-port USB hub so you can plug in all manner of USB reliant things such as memory sticks, digital cameras, MP3 players and PDAs. * The speaker has a treble and bass control for optimal sound tuning. 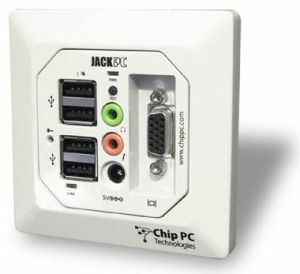 * Totally plug and play, no software required. * Suitable for ages 8 years+. * Requires a USB port as it’s totally USB powered. * Mac OS 8.6 or above. * Size: 10 x 10 x 10cm. The iTech Virtual Keyboard has been around quite a while now in the UK. This small BlueTooth enabled device can act as a keyboard on any flat surface. The iTech Virtual Keyboard projects an image of a keyboard on to the desk in front of you and uses a sensor located at the base to track where your key presses are and then sends them via BlueTooth over to the Pocket PC or Mobile phone etc… which puts it on the screen. Infrared Projector Keyboard – projects a keyboard template onto any flat opaque surface. Runs off mains or battery (2 hour run time per charge). Works with laptops, PC’s, Windows Mobile, Palm OS5 and Smartphone (device must have Bluetooth enabled!). Main unit has sound effects control, intensity of projector keyboard, time out settings (to conserve battery life), key sensitivity. 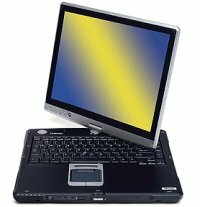 PC Windows 2000 or Windows XP required for installation of drivers onto PDA or other handheld device. Keyboard drivers for PDA or other handheld device or smartphone will be transferred from your PC. Detection Rate – Up to 400 characters per minute. Detection Algorithm – Multiple keystroke support. Effective Keystroke – Approximately 2mm. 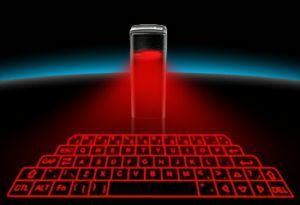 Battery Capacity – 120 minutes continuous typing.